Dental chairs have evolved throughout the decades thanks to advancements in technology. Modern dental chairs are now not only designed for optimum safety and comfort for the patient, but also maximum convenience for the doctor/dentist. 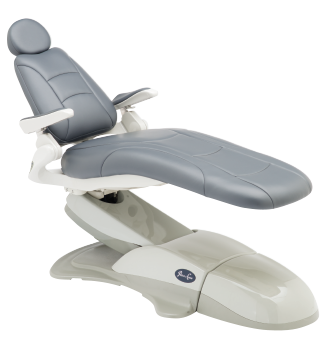 Some of the newer features included in modern dental chairs are double articulating headrests, massage systems, built-in heaters, and touchpad controls. You can compare dental chairs from a decade ago to what we have today and clearly see the wide gap in design. For example, dental chairs today incorporate adjustable height and a narrow back design. What this does is help the medical practitioner optimum convenience and proper posture while conducting the treatment. The aesthetics of the dental chair was often overlooked before but is now part of its construction as well. Dentists now have a wider selection of designs and finishes that will accentuate the overall look of their clinic or office. While not a big deal, it is a nice touch and a welcome design inclusion by the top dental chair manufacturers. Before we head onto the list of the best dental chairs today, let us first consider the factors that separate a standard dental chair from a high-end top of the line one. Dental chairs must have an ergonomic design in order to provide optimum comfort for the patient. 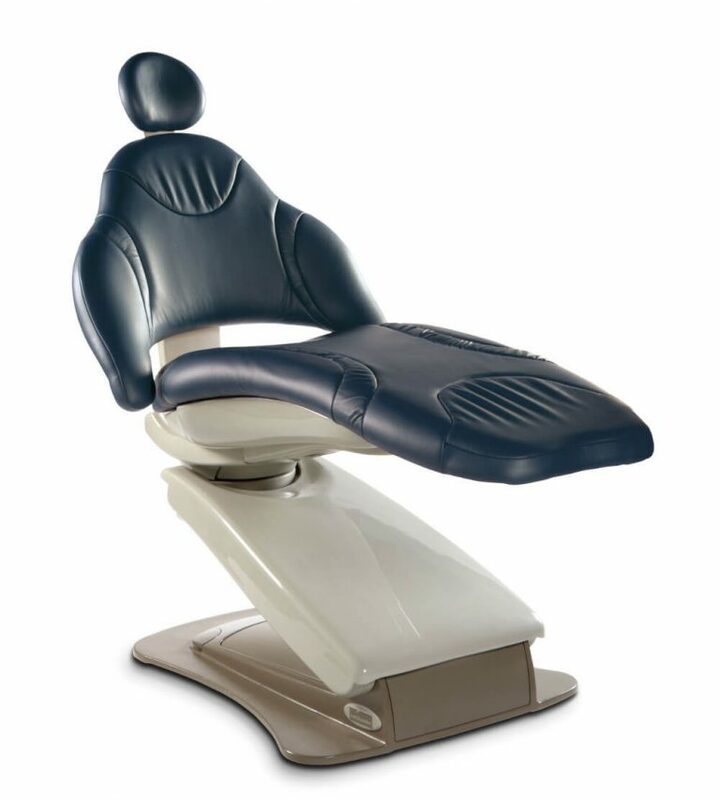 Proper padding and cushioning are always a good sign when choosing a dental chair. Some dental chairs are even designed to contour underneath the patient’s body which improves back support and prevent posture issues. As stated earlier, you can also pick ones that have built-in massagers and heaters to further enhance the patient’s comfort and experience. 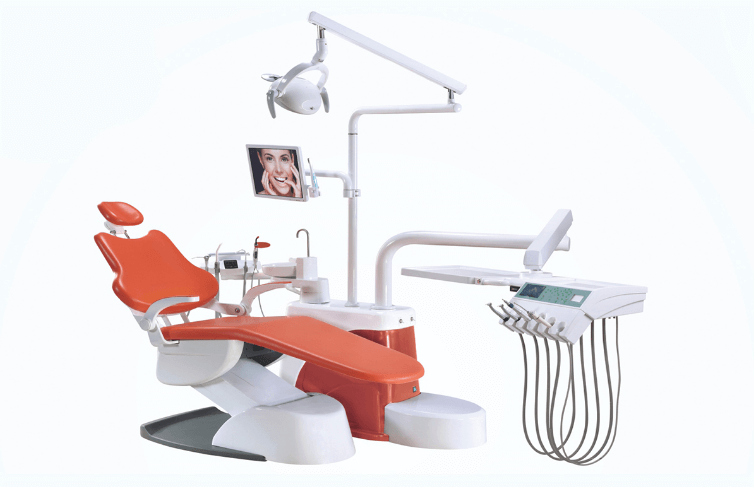 Dental chair should also offer the optimum convenience for the dentist. It is important that they manage to perform the procedure without any hindrance whatsoever. Narrow-back dental chairs are actually a more ideal choice as large-back chairs can hamper the dentist’s movement around during the operation. Foot control using the joystick-style control scheme. Save memory setting for seat positions. Control panel with buttons or touchscreen. Dental chairs can have all the modern features but if it lacks in reliability then all of it is for naught. It is important for a dental chair to be extremely reliable and to still be in acceptable operating performance a decade down the line. If you are looking at a specific model, check the feedback of other dentists to figure out if the chair is a worthwhile investment. The dental chair will be the focal point of your clinic. It will be the first thing to be noticed by your patient so it would be good to make a good first impression. Dental chairs are completely customizable in terms of fabric, color, and finishes. Make sure it will complement the overall aesthetic of your clinic. The upholstery of dental chairs will gather wear and tear overtime. This can’t really be avoided, but fortunately it can be rectified with the use of upholstery kits. This will help give weathered dental chairs a refreshed and new appearance. Most dental chairs in the market today come with a variety of bells and whistles designed to improve convenience for both patient and dentist. For example, you can find dental chairs that come pre-installed with dental delivery systems and mounted lights. These packages are popular in the market due to their ease of use. Installation process is also significantly simplified as you will have no need to hire experts to add electrical wirings in the clinic as the dental chair already comes consolidated with all utility functions. A popular type of dental chair today is the free-standing version. One of its primary benefits revolve around the positioning of the dental delivery system which is located in a cabinet behind the patient. This can actually help keep the patient relaxed as the dental equipment will be completely out of their view. It also feels less constricting thanks to the open space surrounding the dental chair. Research is vital when it comes to choosing the right dental chair for your clinic. Make sure you consult with the dental chair provider to gain expert deduction of the type of dental chair that will suit your clinic perfectly. There are specific questions you will need to ask yourself before you decide on a dental chair. Dental chairs are huge investments and so, will require careful consideration. Brand name is usually the go-to deciding factor when choosing, however, you can also apply some of these questions to ensure that the dental chair you are interested in will be able to provide the level of reliability and safety you desire. How stable is the dental chair? Stability is an important factor in dental chairs. You need a chair that will be able to maintain its position throughout the procedure. You can check chair-mounted delivery systems as these offer more stability when compared to the wall-mounted or cabinet systems. There is one way to check the stability of a chair-mounted dental chair; have a person lie down in a supine position. Elevate the chair to its maximum height and grab the light post and attempt to rock the dental chair. The patient lying down on the seat should not feel any swaying. The baseplate should also maintain a flat position as it is a key part of the dental chair’s ability to provide stability. The large footprint should also be positioned so that it will not hinder stool casters. As for material, cast-iron frames are stronger while also having a sleeker profile. Cast-iron frames are also known to transfer less vibration throughout the whole unit. What is the quality of the baseplate? The baseplate of the dental chair will be the part that will get the most abuse. It will take the brunt of any cleaning chemical used so it is important that the baseplate is extremely resistant to such chemicals. It is also advisable to get a baseplate that does not have a painted finish. Painted baseplate is highly susceptible to scratches which will affect the overall aesthetic of your dental chair in the future. Look for a baseplate that uses a permanent finish like epoxy and make sure the entire baseplate has finishing. This helps prevent the bottom from developing rust. How is the dental chair’s movement? Try the chair’s movement. How does it swivel around? Can it move up and down without any jarring movements? The dental chair should be able to provide smooth transition from one position to the next. Make sure to inquire about the hydraulic cylinder as these will be one of the deciding factors in regards on how smooth the dental chair operates. The manufacturer should be able to give you the specs for the hydraulic system used. Now that you have an idea about the important features and aspects to look for in a dental chair, let us go through some of the most highly regarded and recommended types from well-respected manufacturers in the industry. 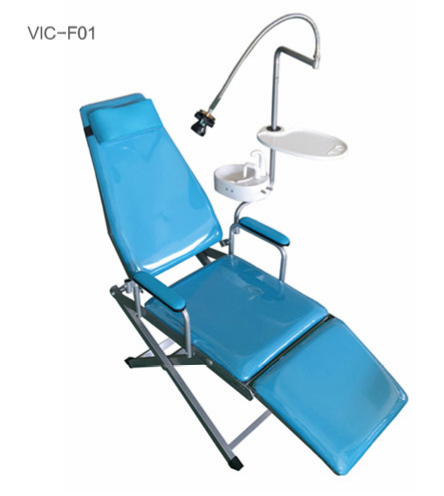 The DCT-329 Dental Chair is manufactured by the company Vic Dental. They are well-known with their top-quality dental chairs. Vic Dental currently has a series of versions to choose from, each utilizing top of the line design and features. The DCT-329 is one of the best-selling series. It uses PU leather seat cushion and ABS plastic covers. Features include a low and high-speed hand piece tubing with connector, double armrest, touch screen display, 6-positions for the electric micro monitor, and an LED operation lamp. It also features a foot pedal with 6 functionalities and an assistant control with sensor control panel. The DCT-329 also features a water purifying and heating system and a comprehensive safety system. DCT-329 is a highly advanced dental chair that has earned its slot in this list with a well-rounded performance and wide-ranging features. The A-Dec 500’s defining feature is its ability to offer optimum comfort for both patient and dentists during operation. The design of this dental chair ensures that the dentist will be able to maintain proper posture as well as comfort throughout the procedure. It is also made so that the patient themselves can maintain a relaxed position during operation. The A-Dec 500 utilizes pressure mapping on the body to help alleviate pain and any discomfort. It has adequate cushion and padding to offer support for the entire body of the patient as they lay down on the dental chair. Another unique aspect of the design here is the “virtual pivot”. This feature adapts to the patient’s movement in real time. This eliminates the need to readjust the position of the chair whenever you need to raise or lower it. Overall, the A-Dec 500 Dental Chair series is one of the most user-friendly modern dental chairs in the market today. You can also customize its features via the official website where you can also check where their closest retailers are in your vicinity. Smooth and quiet hydraulic system. Integrated 300-watt power system to power up the entire unit. Ultra-thin backrest that provides a level of flex that contours to fit the patient’s body. Stable cut away cast-iron base plate. Expanded height range from 13.5-inches to 31.5-inches. Gliding and double articulating headrest. DentalEZis the manufacturer of the CORE dental chair. This is one of the most durable and well-constructed dental chairs in this list thanks to its use of high-grade heavy-duty materials. It incorporates a durable cast iron frame, a sturdy base plate, and stable foot prints. As for comfort, it has been reported that the seat and back rest are designed to optimize the posture of the patient as they lie down. The hydraulic lift cylinder also assists in creating optimum positioning in terms of the height of the seat. This is a plus for dentists as this will be able to accommodate their own preference in order to maintain a comfortable posture during procedure. 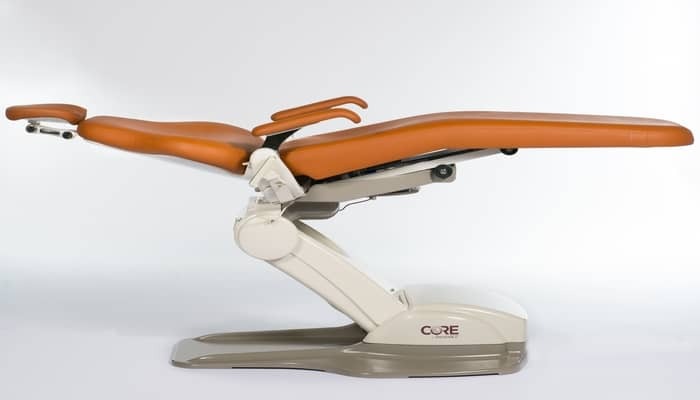 One aspect that is quite noticeable with the CORE dental chair is how quiet it is. Operating the CORE is also easy, simple, and smooth. Other features include touch pad control with 4 pre-set positions that you can program into the controls, and adjustable headrest and armrest, and a 30-degree swivel with lock. It is also important to note that the CORE dental chair comes with a safety emergency shut-down feature. As for the cover of the CORE dental chair, it allows you to choose the standard upholstery that comes in two variations (Naugahyde and Naugasoft with a wider backrest) and an upgraded Ultraleather variation as well. Optional upgrade for Ultraleather upholstery. Optional foot control with programmable preset options. Features Naugahyde and NaugaSoft upholstery. Optional touch pad controls that allow you to program present positions. Emergency shutdown controls for added safety. 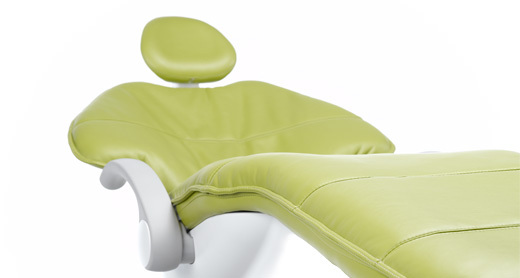 Sleek and comfortable are two words used to describe the DCI Edge dental chair. It utilizes a relatively narrow backrest which allows the dentist to freely position themselves anywhere during the operation. It also features a lower height adjustment which should accommodate the patient’s size and height properly. For those who prefer wider backs, the DCI Edge does come in three variations: narrow, wide, and narrow with slings. Design-wise, the DCI Edge is among the top with its use of a deeper scoop on the back rest. 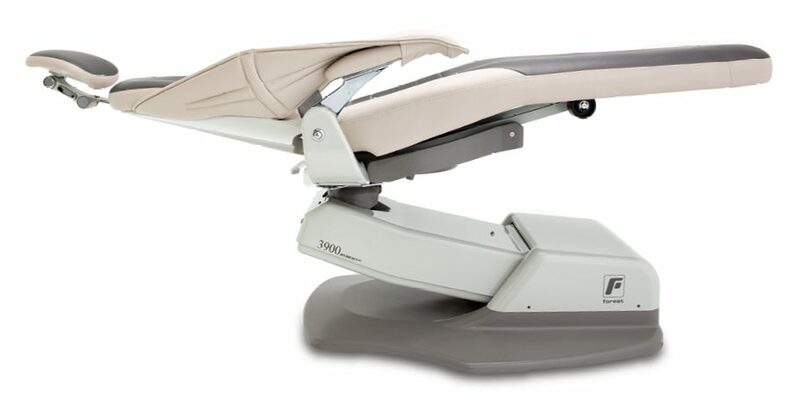 What this does is to allow the headrest to be adjusted and positioned lower to support children and smaller patients without causing any discomfort for taller patients. Additional features include a foldable armrest that helps patients to easily access and get off the chair. DCI Edge dental chairs also come with a 5-year warranty which is always a welcome inclusion in any product. The DCI Edge is an ergonomically designed advanced dental chair. It is all about comfort and convenience for both patient and dentist and it passes this test with flying colors. Utilizes four layers of foam to provide premium level of comfort for the patient. Rotating armrest provides easy access for the patient. Hydraulics can offer lower height to give dentists the best positioning during procedures. Another all-in-one type dental chair, the V2 from Vic Dental is among their most popular products and it is easy to see why. The V2 is filled to the brim with features that are necessary to ensure quality experience for the patient while assisting the dentist during operation with its overall ergonomic design and features. The V2 utilizes PU leather and well-placed padding and cushioning around the seat, backrest, and headrest. It comes with a halogen operation lamp and a water heating system. The V2 is also known for its impressive mobility in regards to the all-direction headrest and the rotary assistant tray. The V2 has already proven to have lasting power in the market as it is one of Vic Dental’s older series, yet it still manages to break into the list of the top dental chairs in the world today. The V2 dental chair series is all about gathering what works and combining them into one reliable machine. 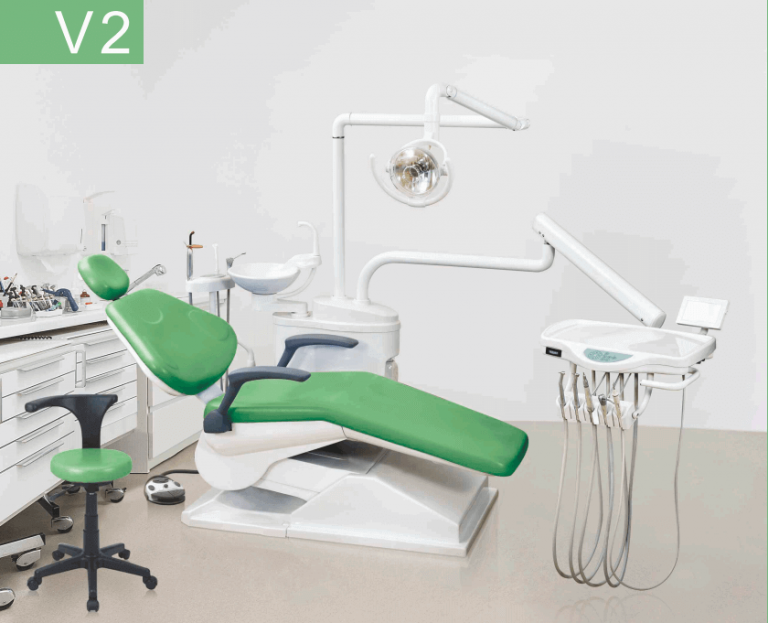 The V2 Dental Chair manages to look good while also offering practicality and reliability. An impressive heavy-duty dental chair, the Forest Dental 3900 is designed to for the long haul. It features molded plastic rather than standard vacuum-formed that is commonly used by most dental chairs. This means that the 3900 Dental Chair is guaranteed to last for quite a long time. The Forest Dental 3900 also comes with the ability for several upgrades and a good variety to choose from as well. At the moment, the 3900 comes in 18 upholstery colors, 3 upholstery options, dual-color and contrast color stiches. Some of the features and options that are available to clients include the inclusion of knee pillows, pedo-wedge, IV board, a built-in back massager, and the option to use a narrow back with sling variation. The 3900 maybe bulky but it is designed to configure whatever the dentist needs. It is considered to be one of the best when it comes to offering value for price in the market today. Wide back design provides adequate elbow support. Multifunction touchpad with a programmable 4 preset option. Backrest features lumbar support for added comfort. Headrest is double articulating for maximum flexibility. The first thing you will notice with the KaVo ESTETICA E70/E80 Vision series is its predominantly minimalistic and modern design. This design choice gives it a less cluttered look and a neater appeal which is something clinics should be able to exude with confidence. KaVo ESTETICA provides dentists with a completely personalized experience as they can customize how the ESTETICA Vision incorporates its dental equipment. This will allow dentists high levels of convenience when using this unit. Customization is the name of the game with the KaVo Vision series which allows for a unique experience for each dentist who chooses this brand. The innovative design of the KaVo helps separate it from the rest of the dental chairs in this list. However, it also means that it requires a highly experienced eye to ensure it will be optimized for the specific operator. In terms of flexibility, the KaVo is no slouch. 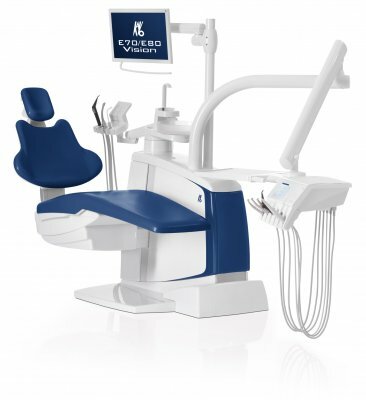 This is a tailor-made dental chair that can offer one of the best comforts and reliability while also ensuring that all operations flow as smoothly as possible. Simple and easy to use touch pad controls. Fully customizable to fit your own personal preference. New unobstructed armrest design offers easy access into the chair for patients. Touch display offers all the important information and functions. Midmark Elevancedental chair is another minimalist and ergonomically designed stool designed with the utmost care. It provides easy access for patients while also providing optimum comfort. Dentists will find the unobstructed design of the Midmark Elevance to be one of its strong points as they can easily operate with ease. It features a relatively thin backrest made from narrow cast aluminum. The backrest is also contoured to optimize the patient’s posture and in return, improve their overall comfort. Midmark Elevance also features their patented SerenEscape technology. This is massage and heating system that helps alleviate tension from the patient during operations. Flexibility with the Midmark Elevance is also considered one of its strong points. This high level of flexibility is accomplished with help of their exclusive Cantilever Forward design. This design allows the dental chair to be positioned properly using a wider range of motion that is not common in some dental chairs. Think of Midmark Elevance as the contortionist of the group. The Midmark Elevance dental chair is available as chair only or with console mount configurations. It is also compatible with all Elevance and Procenter delivery systems. The Midmark Elevance definitely earns its marks and a spot in this list. Patented SerenEscape technology that utilizes a built-in heating system and massager. New Cantilever Forward design for optimum mobility and positioning. Advanced hydraulic system that can support up to 200kg. Electronic chair rotation via release pedal for simple operation. Foot switch control is programmable. 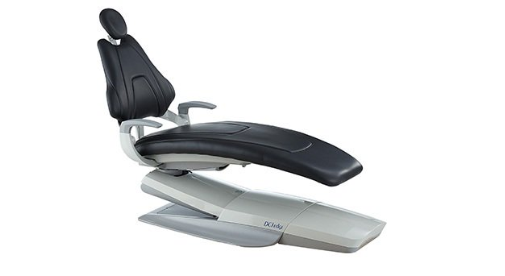 Sleek, modern, and ergonomically designed best describes the Spirit 3300 dental chair at a glance. It offers impressive stability, smooth operation, as well as a nice aesthetic design that fits with most clinics. The dental chair is also designed to go down exceptionally lower to accommodate dentists’ preference for optimum oral activity access. It also features a narrow backrest that is contoured to provide optimum posture and comfort for the patient. The design of the Spirit 3300 takes into account accessibility for both patient and dentist. Installing dentist delivery system manages to provide dentists with maximum range of movement thanks to the positioning. It is also designed with simplicity in mind. The dual touch pads with one-touch programming controls allow for easy, quick, and simple positioning of the chair. It also allows the dentist to control the chair without the need to reach for different levers. The Spirit 3300 dental chair is among the most user-friendly in the market today. Simple and reliable, it is a highly trusted brand used by dentists around the world. Brand new base design that can support 450kg. Narrow back design, 11.5-inches across. As the name implies, this is portable dental chair designed for mobility. Design of the VIC-F01 maintains the standards as it offers comfort for the patient and accessibility for the dentist. Do not expect it to feature an ergonomic design as it focuses more on delivering the most practical approach while also being a portable lightweight dental chair. The seat uses PU leather cover. As this is designed to be brought from one place to another, dirt and grime will be an issue. Fortunately, the PU cover is easy to clean with the use of a clean towel. The seats are adjustable as well as the headrest and backrest. It does have a weight limit but since it can support up to 200kg. you can expect it to accommodate the majority. Additional features include an LED operation light, dental instrument tray, and a spittoon. Overall, this is a bare bones dental chair designed for specific use. For clinics who offer their services from location to location, the VIC-F01 is a solid choice. Choosing the right type of dental chair requires proper research and preparation. There are so many factors to look at that it might seem daunting at first. One fool proof method is to always ask questions. If anything is even remotely unclear, make so that it becomes clear. Dental chairs should provide a peace of mind for both patient and dentist. Which means comfort, reliability, safety, and functionality must all meet industry standards. Use the list compiled above to see which types of dental chairs have already proven themselves in the market to help narrow down your choices.